Last fall a charity (which I can't remember the name of for the life of me) was having a special cupcake promotion throughout the city. Amy's Bread was on the list so I decided to try one. After all, a portion of my hard earned money was going to charity! But it's a good thing it was for a cause because I don't think I would try one again. 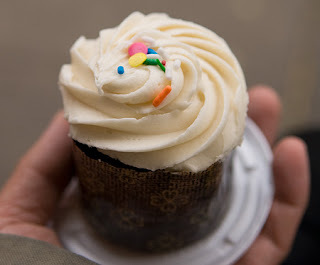 I had a cupcake similar to the one pictured here and it was very dry and crumbly. That's one thing that I hate -- cupcakes that fall apart into little pieces. How can you enjoy a cupcake if it's in one hundred little crumbs? Maybe it was because I tasted mine towards the end of the day but it just wasn't what I was hoping. Their cupcakes are also very tall which made for a difficult time eating it. You shouldn't need a fork to eat a cupcake. The point is that it's a bite size version of a full piece of cake. Finger foods, people! :) So all in all, not my favorite cake in the city.